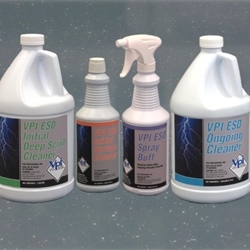 VPI 04301Q ESD Spray Buff - Micro Parts & Supplies, Inc. Description Formulated specifically for the on-going maintenance of ESD floors. Combined with your low-speed buffer and a red or natural hair buffing pad, a quick way of rejuvenating your ESD floor when a major cleaning is not required. Quickly remove surface scratches, black marks, dirt, dullness and unsightly traffic lanes. Simple and economical to use. High luster.